Hooper 1 is to the right behind the bathroom pavilion. Field layout map at Valley Forge Middle School. Goals must be returned to the standard spots on the white lines. Hooper 2 is to the right behind the bathroom pavilion. Field layout map at Valley Forge Middle School. Hooper 3 is to the left behind the bathroom pavilion. 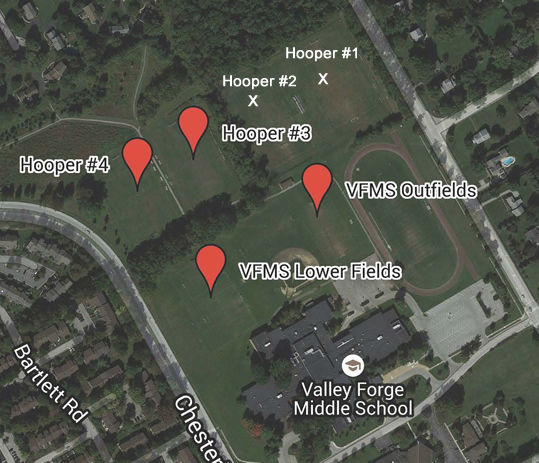 Field layout map at Valley Forge Middle School. VMFS and TEMS teams play soccer games at VFMS on all 4 of the Hooper Fields. Goals must be returned to the standard spots on the white lines. Hooper 4 is to the left behind the bathroom pavilion. Field layout map at Valley Forge Middle School. Field layout map at Valley Forge Middle School. The outfields are directly in front of the bathroom pavilion. Field layout map at Valley Forge Middle School. Enter Wilson Farm Park via Lee Rd.